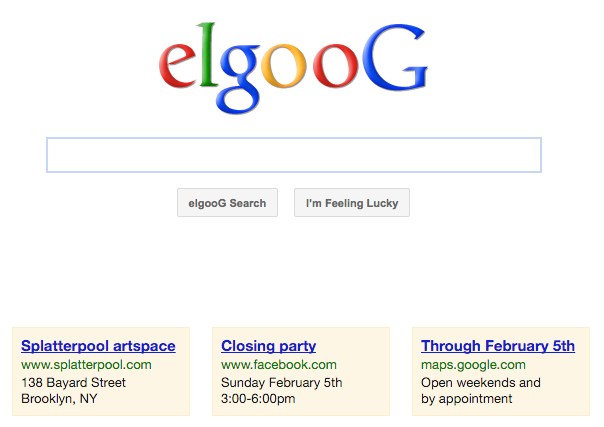 The public project moc.elgooG turns a mundane internet search experience on its head, providing a reversal of everything Google. An iconic broadcast tower sited outside the Splatterpool storefront transmits an alternative, locally run wifi network that offers a critical take on popularity-driven search algorithms. moc.elgooG users access a portal into the deep recesses of the internet, exposing material that often remains hidden in an ordinary, Google dominated search environment. This alternative search experience will be broadcast to the neighborhood surrounding Splatterpool. Inside the gallery visitors will find a moc.elgooG kiosk and a live projection of local user queries and resulting web traffic from across the moc.elgooG network. moc.elgooG was created for the show Sys(x)tem by the collective Future Archaeology: Thomas Dexter, Heather Dewey-Hagborg, Ellie Irons, Joseph Moore, Dan Phiffer, and Matthew Radune.